I've added two new jewellery classes to this month's teaching schedule. The first one is working with coloured wire to make a sweet little bird's nest with a clutch of pearl eggs. And the second one I'll tell you about next week. 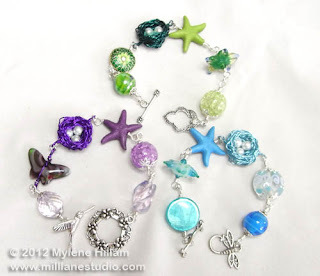 If you've ever had the experience of store bought jewellery falling apart on you, then this class is perfect for you. You will learn how to make wrapped loops at each end of every bead so that your jewellery never falls apart! You get to choose the colour of the wire to make your nest with and select coordinating beads from my extensive collection. 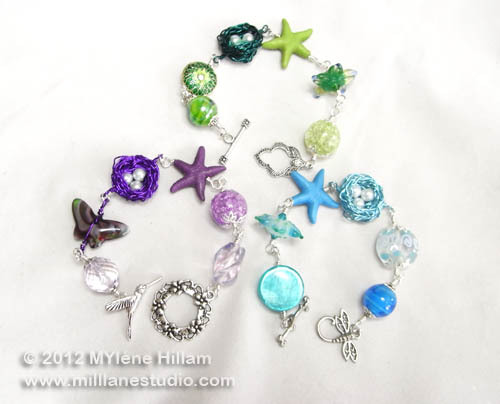 There are some really pretty beads to choose from so designing your own bracelet will be half the fun of this class. More details can be found on the Current Class Schedule page at Mill Lane Studio. Bookings can be made by emailing me.